Hi, I’m Mary and I love what I do! I get to help people realize their American Dream, and I’ve been doing it since 1979. 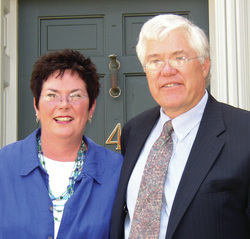 My husband, Hugh, and I had our own real estate company in Victor, NY for years and merged with Mitchell Pierson Jr. Inc. in 1993 – and it’s been a wonderful partnership. We love seeing our clients make their dreams come true; whether it’s a first home, move up home, vacation home, down sizing for retirement or re-locating....whatever their needs are...We’re here to help make it happen! A wise man once said, "May you live in interesting times." It has been my good fortune to have done exactly that. I began my career in real estate working with an outstanding group of people and continue in that vein. Over my career I have been fortunate enough to manage a real estate company, operate a construction company, and develop large tracts of land. I have worked with the Town of Victor and the Town of Canadice and helped preserve land where preservation was the best use of the land. I have helped hundreds of families in their search for a new home, and hundreds of sellers in their need to convert one of their most precious assets into cash. After forty years in the real estate business my advice is: "Do something you love and you'll never work a day in your life."